Don't Think Twice Review | Nerd Much? Improv comedy has always seemed like a scene that is kept underground in various big cities as if you need to know the right person to find the best improv show in town. 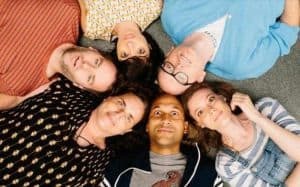 Don’t Think Twice is a heartfelt comedy that seeks to shed some light on this often overlooked field and it does so with mild success. Directed by Mike Birbiglia, this comedy seeks to break the mold of our traditional raunchy summer line-ups with one that feels incredibly grounded and real. This is especially true for anyone who has been trying to make it in show business or are doing a job they love for little pay. Don’t Think Twice follows a 6 member New York comedy troop on their last legs. The theater that’s used is up for sale and the cast’s last shot at comedy fame is Weekend Live. If you cannot guess from the name alone, Weekend Live is basically Saturday Night Live and thus the epitome of where a lot of comedians want to go. It’s an interesting addition as Don’t Think Twice decides to not satirize the famed show, instead the film uses it as a way to explore how fame and allure of fame can distort one’s perception. This gives the movie a far different feel, lending to more organic and natural character turns than you’d expect in a comedy movie. Naturally one of the six gets a job at Weekend Live (We can’t spoil who) so the rest of the movie turns into an exploration for how a bunch of middle-aged comedians deal with the fact that their time could very well be up. There’s a hint of dread lingering behind the curtain here, as you watch these characters drift apart from each other slowly. And yes, while the story itself is pretty predictable, the wonderful performances from the main 6 cast members helps balance out the hit or miss script. This goes for the characters as well, since many of their character arcs are extremely predictable and really don’t explore the tropes that they embody. One’s a nerdy art student, another’s a teacher who’s jealous that he hasn’t had his big break yet, and the other is an heir to a vast fortune but chooses to do comedy instead. You can probably see where each of these characters will end up and how they’ll interact with each other just from those descriptions. If it wasn’t for the actor’s performances and ability to seem truly genuine in each scene this would be a huge issue. The center of this story is young couple Jack (Keegan-Michael Key) and Samantha (Gillian Jacobs) who make up the majority of the moral narrative. Both of the characters are quite funny, with Jack obviously overshadowing the majority of his cast mates in terms of jokes, but unlike other comedies, this is on purpose. Jack is a showboat of a comedian who likes to steal the spotlight whenever he can, so Birbiglia’s choice to have Jack take most of the big jokes plays with his character nicely. Samantha is hit or miss at times as her story is meant to be compelling, but at times it feels more forced into the plot. She’s the one whose fighting for the improv theater the most, but she’s not given nearly enough screen time to flush this out. Though the sub-story of her dealing with the anxiety of working alone is truly compelling and did keep me invested in her narrative until the end. In terms of the other four cast members well, they really only serve to support Jack and Samantha’s story. That’s not to say they’re not interesting characters, just in a 90-minute film they just come off as afterthoughts. Now that’s not to say Don’t Think Twice doesn’t have some problems, as the ending of the movie really rushed. The film has a rather important blow out between many of the principle characters near the latter end of the second act, which appears to be a set up for all of the mending to take place in the third act. However, a few scenes later and suddenly everyone’s problems are solved, their relationships repaired, and the movie just abruptly ends. It’s clear they wanted to go out on a happy note, but this transition is so utterly jarring it ruins the flow of the film. Part of me feels like some of the film was cut due to run time, as it really feels like entire scenes are missing. 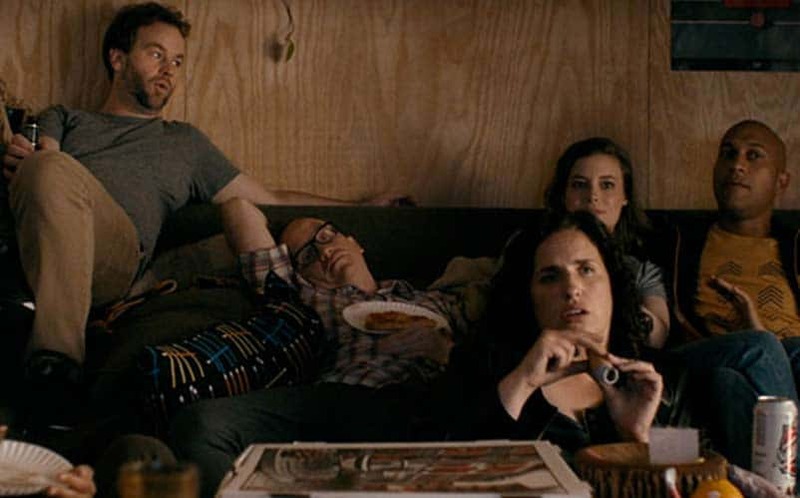 Don’t Think Twice is an enjoyable comedy with some great laughs to be had and an interesting moral problem surrounding the characters. Even with a troublesome third act the plot keeps a brisk pace and you may find yourself tearing up at the end scene. Though if you are looking for a comedy that is more subtle and doesn’t rely on outrageous scenarios than Don’t Think Twice is for you.